Stemming Membership Decline - SCOUT eh! One of the reasons given by Scouts Canada for the implementation of a top down management structure was that it would help stem the loss of membership. The Scouts Canada annual reports show that between 2002 and 2003 the number of registered adults made a precipitous drop from 40,000 to 30,000, a 25% drop (all number are rounded to nearest thousand). The overall membership decline was from 160,000 to 133,000, a 17.5% drop. These declines are unprecedented. For adults, it is three times greater than any previous decline. 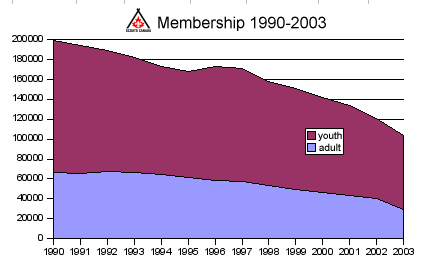 For overall membership, it is slightly less than double the previous largest decline. 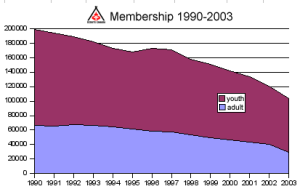 The stated goal of stopping the decline and increasing membership has not been met. Even a modest goal of reducing the rate of decline has not been accomplished by the management-driven reorganization. What is Scouts Canada management's response? More control measures from the top. We now have Group Commissioners who are appointed by the Area Commissioner. No more does a group have a chair elected or chosen by consensus of the Group. The creation of Group Commissioner is the final step in constructing complete top-down control. Accountability runs only one way, up to the CEO (head paid staff member). There is no CEO accountability to the membership. Scouting is a Movement. Scouting works best when it is organized and run from the Group level. When the current system was introduced, Scouts Canada management introduced a mantra: "some tasks are volunteer led and staff supported; some tasks are staff led and volunteer supported." In the Scouting Movement there is no room for "staff led and volunteer supported". The only role of paid staff is supporting the volunteers who provide the Scouting program. As a result of the management takeover, many members are frustrated. They just want to keep their heads down and do their Scouting without concerning themselves with the "politics" of Scouts Canada. This is commendable on an individual basis as the youth under those leaders are likely getting a good Scouting program. Looking at the big picture though, we see that many leaders are just giving up on the program and quitting. We ask you to look at this big picture. Where will Scouting be and where will Scouts Canada be unless the adult membership is maintained? We are part of a movement. A Movement cannot work unless the grass roots members actually have control of the Movement. A democratic Scouts Canada would grow by making the members the real owners of the Movement. Help make a democratic Scouts Canada. Join SCOUT eh!